Every week, the media department delivers digital news, insights and trends directly. We break down buzzwords, provide our POV on current events and share forecasts with our fellow forward-thinking digital marketers. R&R Partners is built on a foundation of unwavering integrity, fierce loyalty, hard work and the relentless pursuit of success for our clients. Success involves being up-to-date on this rapidly changing landscape. Taking a stance may be worth it for brands looking to target millennials. A recent eMarketer report found that millennials are increasingly more interested in social responsibility when it comes to the brands in which they choose to spend money. In recent years, we’ve seen big brands from the likes of Nike to REI, and most recently, Gillette, taking a public stand on social issues of value, sparking public conversation and controversy among critics. 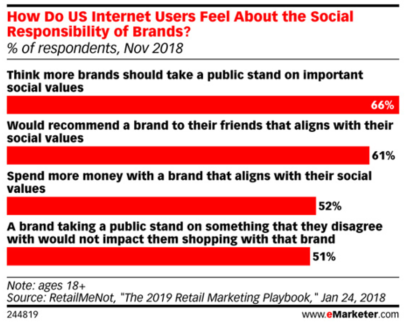 However, nearly two-thirds of millennials want more brands to take a public stance on issues of importance, according to a recent survey from RetailMeNot. Over 60 percent of respondents agreed they’re more likely to recommend a brand if it aligns with their social values, which is majorly important considering that inner circles are often the most credible form of advertising. While brands have often faced backlash for their stance, opposition is usually echoed with support. Take Nike, for example; despite the backlash it received for the Colin Kaepernick ad, Nike’s online sales rose in the days after the ad’s debut. While many companies have flopped at being socially responsible, the benefits could overshadow the backlash when done correctly. Adidas is outfitting its e-commerce site with AI. Need any fitness apparel recommendations? Look no further! Adidas is using artificial intelligence to recommend outfits based on customers’ browsing of Adidas products. The athletic-wear company has partnered with Findmine to automatically build outfits for the website’s “Complete the Look” feature. Prior to leveraging AI, Adidas merchandisers would manually build outfits for the outfit recommendation feature, which resulted in less than 10 percent of products appearing in outfits, according to Chain Store Age. By implementing AI, Adidas has increased the number of items included in outfits by 960 percent and has allowed for merchandisers to spend 95 percent less time on the “Complete the Look” feature. It found that the average customer order value significantly increased when customers were presented with outfit recommendations. This AI implementation has saved Adidas time, money and increased sales. Integration rumors are swirling for Messenger, Instagram and WhatsApp. The three social companies are owned by Facebook, and it’s rumored that the social media giant wants to take integration to the next level with cross-platform messaging between the apps. The alleged plan is for the apps to still function as stand-alone apps, but for their technical structure to be intertwined, allowing nearly 2.6 billion users to communicate across the three platforms. The integration is yet to be confirmed by Facebook. However, The New York Times reports that the messaging plan is estimated to be completed by the end of 2019 and beginning of 2020, and will change how billions of users communicate. Pixel: a piece of code that is used to gather marketing information. API (application programming interface): a set of functions allowing for the creation of applications that access the features or data of an operating system or application.